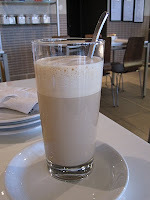 Da Capo Caffe - a great place for Pizza, Paninis, Coffee & Gelato! Update 2014: Da Capo has now moved down to Whyte Ave. In it's place is Rosso Pizzeria which has a real wood fire burning pizza oven! 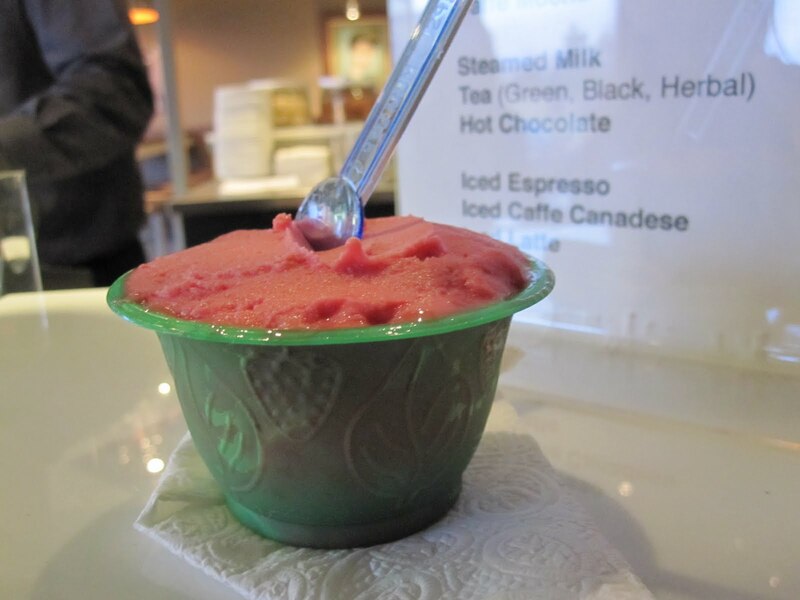 Da Capo is located on the northwest corner of 109st and 76 ave. Sandwiched between the Garneau block to the left where Transcend's T2, Whimsical Cupcake Studio, and Kabuki Sushi is located, and Sugar Bowl and High Level Diner to its left. Personally, I'm a fan of Da Capo and not just for their food! I love the modern look of their slate floors, glossy white tables, and a mixture of booth-style seats, high seats and regular dark wooden table seats. There is even a small patio for those of you that love sitting outside in the warm weather! Da Capo's physical menu has changed considerably from one that was recited to you, then to a scribbled chalk board, and now a 3 panel framed display ranging from small breakfast items, drinks, zuppas and insalatas, fresh paninis, thin crust pizzas, and of course their desserts (mmm..gelato)! The only complaint we had about their menu board's position, is that its located right next to one of their cash registers. This often resulted in the feeling that we had to order immediately. We appreciated that the server wanted to be helpful, but sometimes waiting a bit longer may have helped. 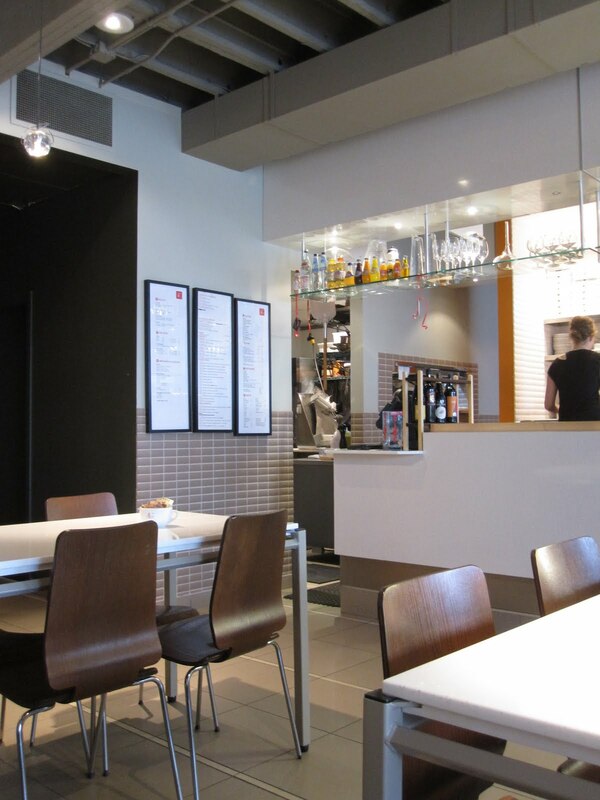 Perhaps, having printed copies of the menu available would allow customers to decide on their order at their table. Here are a few selections from my last two visits this month. To the right, Cafe Canadese for $3. This visit's coffee was a bit on the lukewarm side, but generally their coffee arrives hot! As well, they now have ecco-friendly to-go cups if you forget your own. Pizzas are thin-crust creations. They have a good selection of either red (tomato based) or white based (olive oil and spices) pizzas (more red pizzas then white though). Pictured below is the Capricciosa (minus olives) - red pizza with mushrooms, mozzarella, artichoke hearts, ham, and basil. Note: Minus olives, since my lunch companions were not huge olive fans. 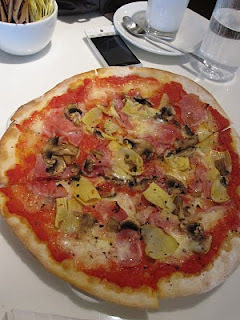 The special that day was a pizza , who's name I've unfortunately forgotten! Regardless, this particular red pizza was equally tasty as his red counterpart. The pizza crust was perfectly thin and had just the right amount of ingredients on it. 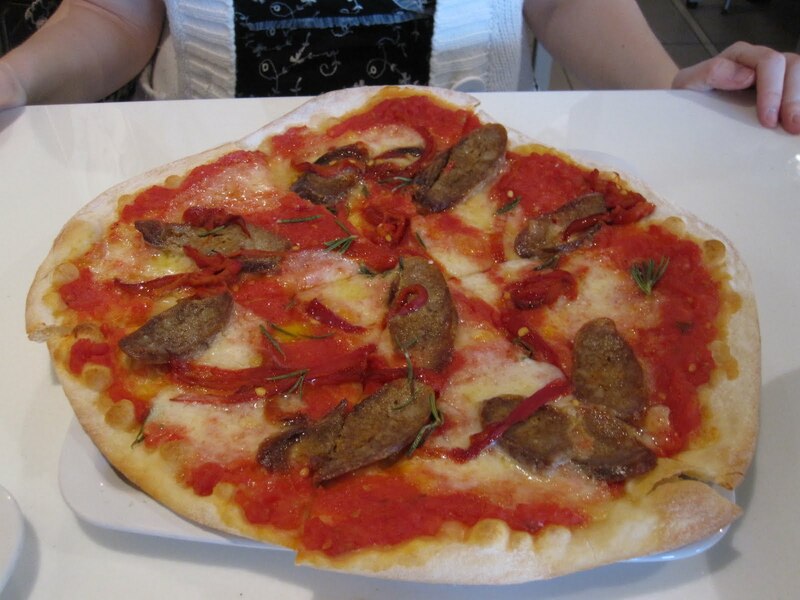 Pictured below is the red tomato based pizza with Italian Sausage, sun-dried tomato, mozzarella, and fresh rosemary. Last night's dinner had us enjoying a particularly appetizing chickpea salad ($6 for the larger portion) and an incredibly tasty white pizza - the Di Roberto . We were surprised at first with the chickpea salad, since my friend and I both thought that there would have been some actual greens comprising the salad. In the end, we were happy with the portion size and the taste. 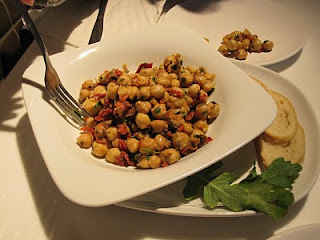 The chickpeas were the perfect texture (not mushy and not hard) and tossed with sun-dried tomato and what seemed like bits of fresh parsley. There were also three crisp pieces of bread accompanying the dish. 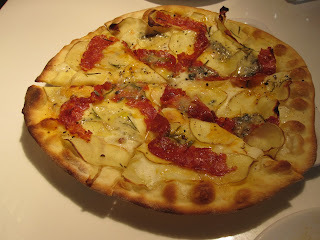 The white pizza had thin slices of potato, mozzarella, gorgonzola, spicy sausage and fresh rosemary pieces. My friend commented on how thin the pizza dough was and wondered if it was machine made or hand-rolled, as the entire pizza was one uniform "thin-ness". The potato slices were cut so thinly and crisped a bit in the oven that it felt like eating potato chips. Definitely a great addition to a pizza and one I would recommend! The other nice thing about Da Capo is that it's right next to the River Valley and its many trails. 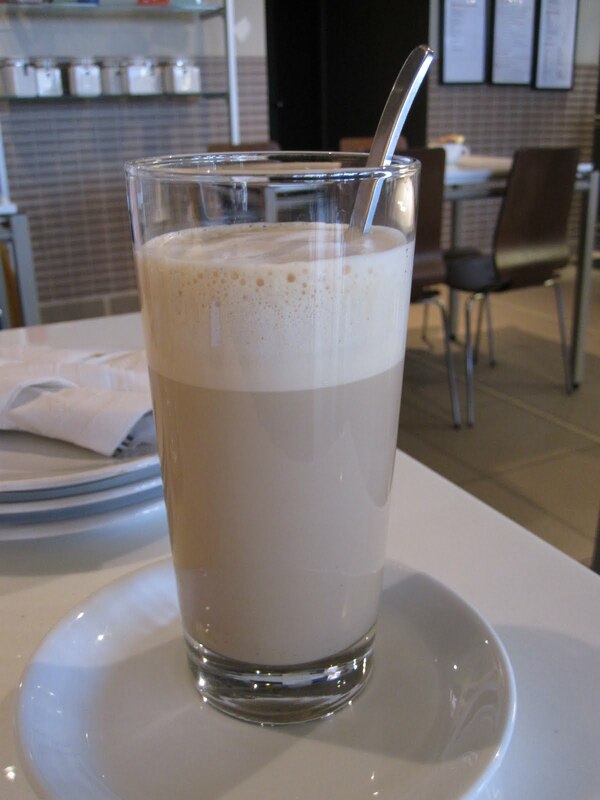 So the next time you're in the mood for a walk near the River Valley, consider stopping by Da Capo for a coffee and a bite to eat. Their gelato is also great company for your walk! mm..Raspberry Gelato. Perfect after dinner or as a snack! There's something about that chickpea salad that is so appealing. I tried to make it at home, but I can't figure out what they do to make it so yummy! And the di Roberto pizza with the potato, sausage and rosemary is our favourite. Great recommendation. Thanks for the post!